In my previous article I came across an amazing icon set i.e. Ultra Flat icons. I have been trying it out and have written 5 tutorials about it but now I was looking at these orange folders and wondered what it would look like if I changed the folders to dark gray folders. I fell in love with these folders. And ended making these starting from the orange icon set. Since I like this set as well, I am considering keeping this github up-to-date to be able to install this specific icon set dubbed Ultra Flat Majestic. These dark gray icons are not standard in the theme but with some minor scripting knowledge you can achieve this. You can then apply the same steps on any svg icon theme and create your own personal icon set that no one else has. The above code will replace all orange folders in dark gray folders, which gives it a cool look. We start this code in the places folder of the ultra-flat-icons-orange via a terminal in the folder scalable. From now on I will not only use the color but also the code in front of it. In this movie we are covering the creative phase. How to figure out the current colour with tools like Inkscape and Sublime Text? What colour to replace the original colour with? 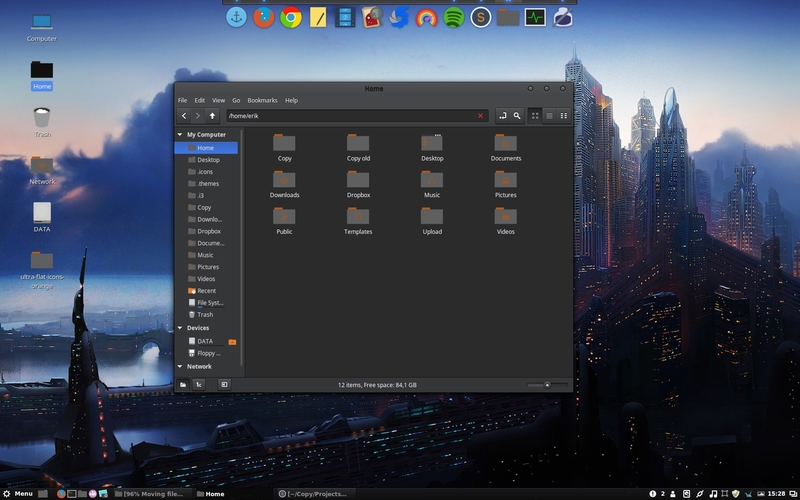 Now that the icons have been created we should also make them available to the linux system. Naming the index.theme and the folder are the two steps. Choose the icon theme with your preferred program. A few hours later I had changed some of the icons that were not gray and conform to the Ultra Flat Majestic icon theme. Here you can download this icon set.